I took my year 13s to meet the Internet after school Thursday. During our volunteer visits in training, Blakey got to go with now-RPCV Meghan’s year 13 class to meet the Internet, and ever since I’ve wanted to do the same with my own kids. Regular blog readers will remember when I took Filifili to meet the Internet, which served as a pretty good dry run. So when my kids came over to decompress after the PSSC exam 2 weeks back, I promised them a celebratory trip to the Internet this week. I admit I was kind of loathing the whole thing. Logistically getting a bunch of Year 13s across town and then taking up a sizeable section of the Internet café seemed like a lot of work, and this was in the midst of this past week, which was already proving hellish. But it was something I wanted to do, and the kids started asking me about it. School was canceled Friday, so Wednesday afternoon it was decided that we’d go Thursday. From my dry run with Filifili, I knew the kids would need to be prepped, particularly in choosing an email address and a password. So when school got out Thursday, I had the kids come up to the computer lab where we had a 15-minute session on what goes into an email address and why they are used and what theirs should potentially be. And then ditto for passwords. And then I gave a crash course in composing and sending an email. They took notes, which was cute since there’d be no test on this. But their notes did prove somewhat helpful when we got to the computer lab. We took a taxi van. I thought about asking my pule if he’d drive us in the school van, but I was trying to pull the whole thing off without getting too much bureaucracy involved. If my pule drove, I figured the trip would involve a long discourse on the evils of the Internet, and how the kids had better be good Christians when they logged on. In the taxi we just listened to music. I should clarify that the 6 students who came with me to the Internet weren’t all students from my class. Marie, Sinaumea, and Sione came. They are mine. Filifili, Mira, and Faimalo are not in my class, but were able to get in on the action because I was paying and I could invite who I wanted to invite, and the three of them hang out at the computer lab often enough they may as well be in my class. We hired 3 computers for an hour. The first 10 minutes were chaotic since I hadn’t really discussed URLs and basic Internet navigation. 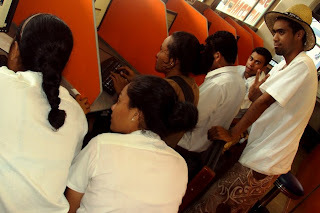 But I was able to get them all to Gmail, and from there Marie, Sinaumea, and Sione were able to get through the sign-up process. After that they were allowed to do what they want. I showed them my blog and Facebook. Koa suggested I show them Bebo. Marie signed up for a Bebo account. And then Mira found YouTube. And then they were all on YouTube. And that was where they spent the remainder of their hour, which was fine with me. Mira and Marie must have watched the same “New Moon” trailer 17 times. I was able to convince Filifili to check out the Silent Library Japanese Gameshow, which he enjoyed. When the hour ended, we went to get ice cream cones at McDonald’s, but they were out, so we went around the corner to Chan Mow and got ice cream there. Sinaumea pulled me aside while we were all eating to thank me. “That was my first time on the Internet!” He said. From Chan Mow, they all left to walk to the Fugalei Market, and I left in the opposite direction to walk home. Overall, the event was a success. 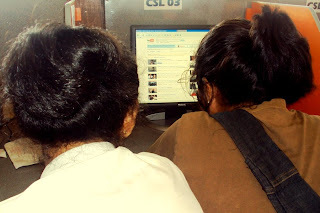 Marie and Mira look up "Chris Brown and Rihanna" on YouTube. 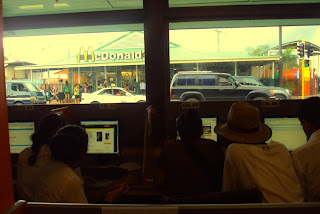 Students on the Internet with McDonalds in the distance. Ice Cream at Chan Mow. WTF?!?!?!?! McDonalds of all places had no ice cream? What is this world coming to! LOL.